I just found this picture i took a while ago. This is the point in the night that I usually feel relieved, when all of the figures and especially the faces on the figures are drawn. It's nice to lay them all out and take a look at them before i scan them and attack drawing the background if it hasn't already been done. 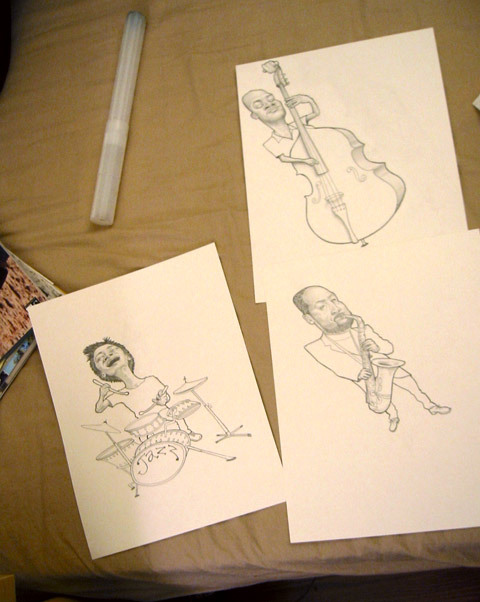 they are all on separate pieces of paper for easier composition changes and stuff. I have stumbled upon or reworked many illustrations into crazier compositions because of this freedom. Anyway when it is 5 am it feels a little better when these guys are all drawn out.